Q: Do you recall the very first game you played in? Trumane Bell: Oh yeah, it was the very first game after my redshirt year. I can remember, it was me, Kareem Moss and Toby Wright. It was all our first game, I can remember walking out onto the field just warming up and looking out into the stands and seeing all these people in red. It might have been only 30,000 or 40,000 people at that time of the day, and it seemed like you could hear the conversations going on in the stands, just warming up. But I can remember going back in the locker room and us three guys got together and we were fired up about it, “Hey, we’re going to play well”. And then running back out there, it was so overwhelming, it almost brought tears to my eyes. Your heart was beating so fast, and I’d never in my life played football in front of this many people. I’m looking up there and all this red. It was very interesting. I remember being so nervous and all the butterflies were going around and, ‘I hope I don’t mess this thing up on the field.’ After my first pass that was okay. The nerves went away and it was just like playing football out in the yard when you were a kid. It was very special. Sometimes it feels like it was yesterday. And I wouldn’t change that for anything in the world, and of course we won the game, too. It was a great moment. A person who doesn’t play at Nebraska? They wouldn’t understand. I told a guy who played at smaller school, ‘Hey man, it was seventy-six thousand! Seventy-six thousand people all in red and it’s the third-largest city on a Saturday, and they bleed Husker red.’ And I can remember just going out to eat after a game and people would come up and say, “Hey, how’re you doing?” and knowing your stats, knowing who you were. I was like, ‘These people are really crazy about Nebraska football.’ You don’t realize it until people come up on the street and go, “Trumane, I know you’re from Chicago and this and that..” (laughs) It was definitely kind of strange to get used to, but it meant a great deal to the people there at Nebraska. And I can see why, because that’s the only show in town. For us to have that opportunity to entertain the people, it’s a blessing and it’s a privilege and an honor. It really was. Q: You say it was a blessing, were there ever any times you think it was actually a curse? TB: No, I don’t think it was ever a curse. I think the fact of the matter was wherever I was at, I knew I represented the University and represented it in a good light and represented my family. You never wanted to do anything to shame your family, and the University as well. I know that sometimes you made mistakes, but you never tried to do anything that could cause you or your family or your university shame. I really don’t think of it as a curse. It was a blessing because you were at Nebraska and they wanted you on the team and you were trying to live up to that expectation. If they were going to offer you a scholarship they felt you were the best and you could help this program out to get to that level of winning a national championship and conference championship and things of that nature. Q: Do you think some guys have a hard time living up to that pressure? TB: I think some guys, maybe. I think it all depends on your upbringing. And sometimes guys are given so much, they think it’s supposed to come easy. But, hey, if it comes easy then everyone would have it. And I believe you really had to work for it to get to that point, I didn’t want anyone to give me anything. I wanted to work for it, because I knew that if I worked for it nobody could ever take that away from me. And that’s pretty much how it was, and I never wanted that to happen for me. I wanted to work for everything that I’d ever gotten. Q: What did you work the hardest on? Q: Did that mindset stand out to you from the start or was it something that seemed to grow as you went along, from your sophomore to senior year? TB: It was there, but I think it was something that had gotten stronger. It was due to the fact that so many people were trying to kick us down. 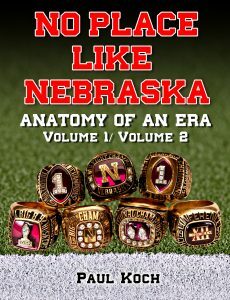 I remember reading something in one of the magazines, “Nebraska, the Paper Tiger.” All these good records in the season and then get to the bowl game and can’t win the bowl game. And I could see in the summertime guys were just working hard, you had more guys stay in Lincoln in the summer and go to summer school and working out in the stadium, and not too many guys were going home. And if you’d spend that whole summer together you learned a lot about each other, you were hanging out in the same places, you were working out, going to school, having the same jobs together. The unity was built there, because if you had guys going home over the summer and then come back in the fall it’s gonna take awhile to build that unity back up. We did things together all the time. It got to where we could tell what a teammate was going to do at a certain point because we were so in tune with each other, because of the time spent together. We could read off of each other instead of having to talk it out, and that was a big thing for us. Getting to know each other on a personal basis, as well, makes you more willing to fight for him. Otherwise you don’t know much about him or he doesn’t want to give that information to you. TB: I think in Chicago there are just blue-collar guys. Sometimes they talk about that Chicago toughness? We definitely had it. I think some of us may have had a little chip on our shoulder because we were from Chicago. And when you think of Chicago you think of the Chicago Bears and the tough guys and all, so when you see other guys from Texas or California, we say, “Hey, don’t think you’re the only guys who can play football. We’re tough and we can play a pretty good game of football, as well, where we come from.” That’s the attitude we had, that we could compete with any guys from anywhere. Q: Did your parents make it to many games? TB: They didn’t make it to a lot. I know my mom made it to a few my junior year and a couple my senior year, but most of the times we were on television they were right in front of the TV watching it. Q: Do you recall her making any comments about the Nebraska experience the first time she saw it? TB: I think she was overwhelmed more than anything. One of my high school buddies came with her to see it and she was like, “This is unbelievable. I’ve never seen people be this crazy about a football game.” She thought it was the coolest thing, but she was just overwhelmed with the entire thing. Q: Does one game stick out to you more than another? TB: Probably the one game would be the national championship game versus Florida State, of course. 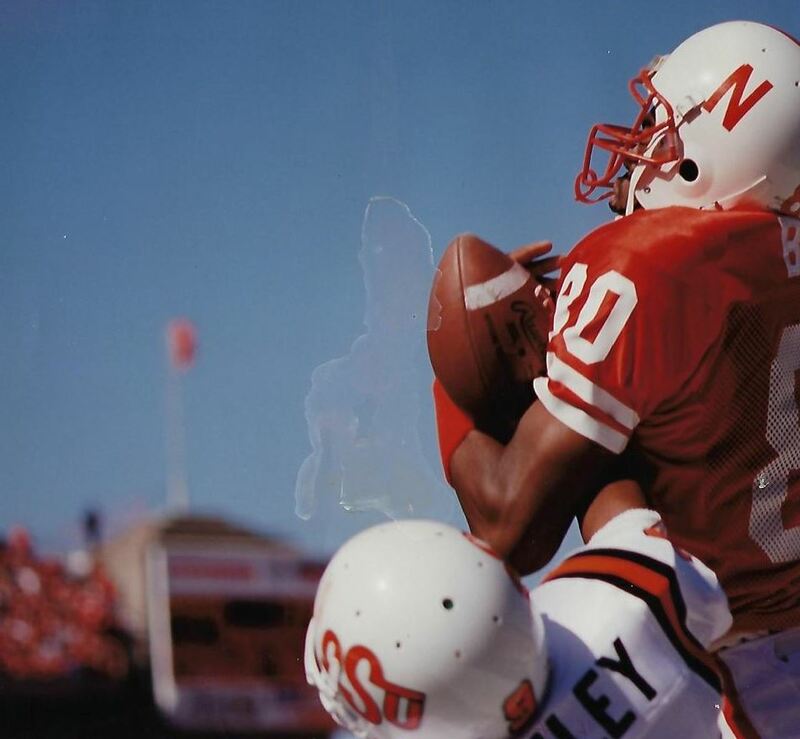 I believe that was the best game I played in my time at Nebraska, in regard to receptions and things of that nature. Even though we fell short but it was still a great ballgame. It’s funny you ask that, because it just came on TV on ESPN Classic a few weeks ago. Me and my wife were watching TV and she had never seen the game, and she was, “Oh, my goodness. You were smaller then.” I was like, ‘Yeah, I was a little smaller then.’ And she was like, “Man, you were pretty good.” And I said, ‘Yeah, I thought I was okay.’ (laughs) That national championship game really stood out. 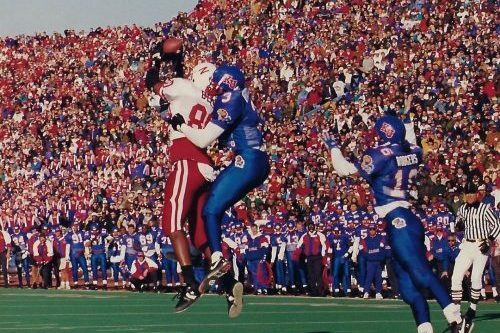 I think another game that stood out that same season was that game against Kansas where they had come back at the end and I had the last touchdown to put us over, so those two games stand out to me. Q: And what specifically stands out to you about that Florida State game? TB: You know what, what really stands out to me was that we really played hard every play. No one gave us a chance to win that ballgame. And I think the way we played the ballgame put us back on the map. Even though we lost that game -you know there could have been a few calls here and there that could have changed the outcome of the game- but there‘s even a few Florida State could have had, as well. But that game there set the tone for the next couple years, with the back to back and then in ’97. I say, ‘Hey, if you look back on that one, we could have won three to five straight there.’ I think about how good we were: a young quarterback in Tommie Frazier, a young running back in Lawrence Phillips, and all the skill we had there. We had a big offensive line that was just pushing people up the field so we could easily have won a couple more, but we got the three and that’s better than nothing at all. Even though I didn’t get one, I feel like I’m a part of them. Q: Did you watch the whole ESPN Classic replay with your wife? TB: We watched half of it. I DVR’d it because it was getting later in the evening. I went back and watched it and have kept it on there to watch again. And it’s funny, because I have some of the items hanging up in my basement -a few posters and things like that- and people from work come by and say, “Man, you really played football for real.” And I’m like, ‘Yeah, I didn’t play for play.’ (laughs) I guess it just really shocks them when I tell them I played for Nebraska and they just say, “Oh, yeah, you played for Nebraska”, but when they see the stuff they say, “Wow, you really played for Nebraska! !” (laughs) It’s funny. Q: I’ve got tell you, Trumane, a buddy of mine called earlier tonight and wanted me to come over and watch Monday Night Football, and I told him I couldn’t come because I had this phone appointment with you. And I described you like this, “This guy, Trumane Bell, was a gamer. I will never forget: there were 20 seconds left in the national championship game, we desperately needed a third-down conversion to stay alive, and at the last second this guy runs onto the field, lines up in formation, takes off at the snap and makes the catch that gives us one last chance at victory. He was clutch!” And I think you ran a post pattern… but you ran the pattern and made the catch that simply HAD to be made. Do you remember that? TB: Yeah, and the play before that they threw the football to me, too, but it was broken up. I looked for that one. And I was like, ‘If I make the catch we are on the 20, or we possibly could have even scored a touchdown from there.’ I think I’m more critical of myself for that one, because I think that’s a catch I probably should have made. But it was still great to have the opportunity to come back the next play and make that play. It’s just funny, because at the time I was thinking about the time on the clock, thinking about making the catch, thinking about trying to score. I get tackled and then all this stuff is going on and there’s time left, and I was like, ‘Oh boy, we still have an opportunity.’ And I can remember going to the sideline and we’re getting set up to go for the field goal and I said to somebody, ‘You know what, Byron is gonna make this field goal.’ And then when it went wide left it was kind of disappointing. But you know what, I was glad we still had that opportunity. And you think about both teams; a ton of guys for both teams played in the NFL. And here was Derrick Brooks, an All-Pro, and I swear he only had one tackle that whole game, and it was on me. TB: That last one was the only tackle he had the entire game and it was against me. He was a great player, a really great player, but I think we were actually better than them that night. The final score doesn’t show that, but hey, I think we played well and showed ourselves well. Like I said, it definitely put us back on the map to be reckoned with year in and year out. Q: That last catch you made –before Byron’s field goal attempt- was the ball supposed to go to you or were you just one of the options? TB: Well, on that play if I opened up I would get the ball. Because what happened was, I was supposed to run a streak route up the middle of the field and the linebacker has the option of going inside… so when he jumped out on me I just slanted inside and looked right away because I knew the ball was going to come, because I knew there was no one else in the middle of the field. So Tommie saw it, I released to the inside, the ball came, I made the catch, and then I was just trying to get the most yards out of it. And that’s how it happened, it was just like we practiced every day in practice. You didn’t think about it, you just did your job and then see what you could do with it. Q: So you’d done it a hundred times and this was just number one hundred and one, right?